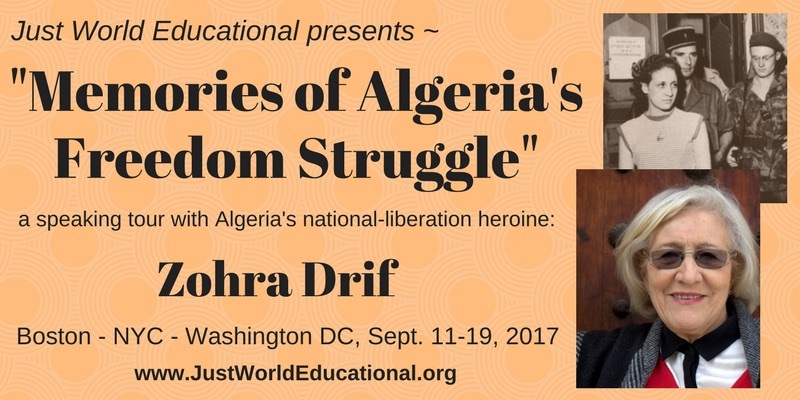 Zohra Drif brings speaking tour “Memories of Algeria’s Freedom Struggle” to US in Sept.
Just World Educational is delighted that in mid-September, we’ll be bringing to three cities in the United States the voice and immense wisdom of Algerian national-liberation heroine Zohra Drif. Washington DC, where she will speak at the Woodrow Wilson International Center on Sept. 18, at 2 pm, and at Georgetown University at 6:30 pm. Back in the 1950s and 1960s, Algeria’s freedom struggle aroused the support and admiration of progressive, anti-imperialist voices worldwide, including among people in the United States as disparate as Sen. (later Pres.) John F. Kennedy and leaders of the Black Power movement like Eldridge Cleaver. Mme. Drif was an integral part of Algeria’s freedom movement. As a young nationalist, she participated in the armed struggle launched by Algeria’s National Liberation Front (FLN)– a struggle memorialized in Gillo Pontecorvo’s timeless movie “The Battle of Algiers”. Five years later, in 1962, when Algeria won its independence from France, Mme. Drif and other political prisoners held by the French were released as part of the decolonization agreement concluded between the FLN and the French government– as was normal practice throughout the whole process of decolonization. In her case, she was soon thereafter elected to Algeria’s first independent parliament. She later pursued a career as a criminal-defense lawyer before being appointed to the Senate some 15 years ago. Mme. Drif’s memoir has a powerful Foreword contributed by the former Algerian Foreign Minister (and prominent UN diplomatist) Lakhdar Brahimi. 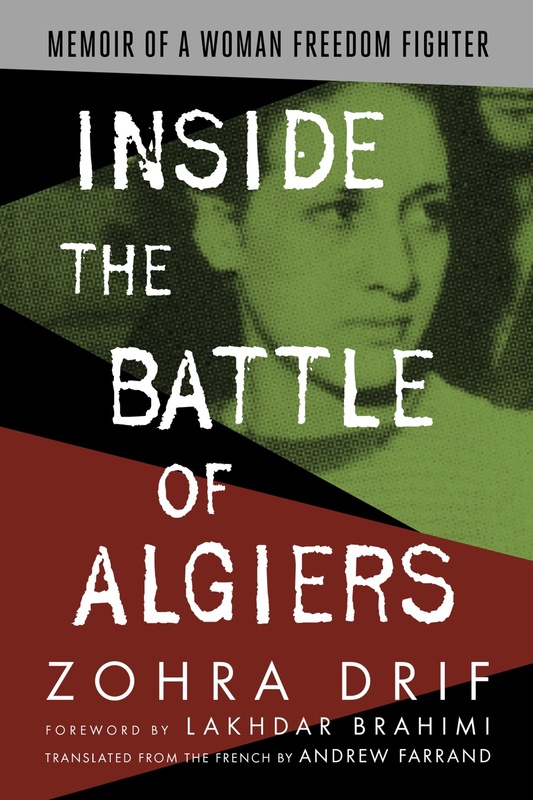 More details about Inside the Battle of Algiers can be found here. The book will be available for purchase and signing at all of the events on the September tour. On the tour, Mme. Drif will be accompanied by Andrew Farrand, a native of Baltimore who has been living in Algiers for some years, and who translated Inside the Battle of Algiers from its French original. Mr. Farrand maintains a lively blog about his life in Algeria (and his travels elsewhere) at ibnibnbattuta.com. While on the tour, he will be available to help with interpretation as needed, though Mme. Drif will be giving her readings from the book in English. As we and our partners are able to nail down further details about Mme. Drif’s tour, we will be posting them on this calendar on the JWB website. Stay tuned!